Happy 5th Birthday to Ghost Lover! It’s hard to believe that the very first book I published is five years old today! On May 12, 2012, I took a leap of faith and I’ve never looked back. It was the hardest step I think I’ve taken in my life. I remember the first time I worked on this manuscript which was eighteen years ago. I had a new baby, accounting business, house, hubby, and life going on all around me, but I needed an out. I’d worked on writing since I was a teenager, but this story pulled at me, even that long ago. I wrote at least two thirds of it, then put it in a file as my son got older and my business grew. All of a sudden, I didn’t have the time to work on it. Then my assistant (Now my editor and one of my cover designers) pulled the file from the back of my desk drawer and fell in love with the story. This is one of my favorite covers. And it was my first real attempt at making something out of my writing and taking it seriously. This book took me to the bestsellers list within six months, which really excited me. But, as my writing advanced and I learned more about the world of grammar and writing, I knew that my baby needed a makeover, so in amongst all of my works in progress, I began the process of overhauling my work. The newest edition of Ghost Lover has astounded me in it’s depth of love, romance, suspense and other emotions that I can’t exactly explain. Here’s the newest cover, which I’m totally in love with. So, as you can tell, Ghost Lover has been through many changes over the last five years, but the heart of the story has never changed. When true love is there, nothing can tear you apart. Categories: Uncategorized | Tags: #amediting, #amwriting, Amazon, Anniversary, Author, Birthday, Book Anniversary, Ghost Lover, memories, Romance, Romantic suspense, Suspenseful Romance | Permalink. Ghost Lover is 4 today! It’s a beautiful morning here in Georgia. A little cool, but nice and sunny. Today Ghost Lover, my first published book turns 4! Wow, I can’t believe it’s been four years. Time really does fly when you’re having fun. If you haven’t read Ghost Lover, let me give you a little bit of info. Ghost Lover is a romantic tale of love and betrayal. Here are the blurb and an excerpt from my favorite of all my books. This one holds my heart, I guess because it was the first. “Why’re you here in the shadows? Why don’t you come into the moonlight so that I can see you?” She noticed he lowered his head and then looked back toward her. “I don’t want you to see me this way. I want you to remember me before you look upon my face.” The sadness in his voice did something inside her heart. This is one of my favorite parts and it leaves you wondering, is he a ghost or not? Categories: Uncategorized | Tags: #amwriting, Anniversaries, Authors, Birthdays, Cowboy, Fresh from the Book, Ghost, Ghost Lover, Horses, Publishing, Romance, Stephanie Hurt, Writing | Permalink. It’s hard to believe that I’m coming up on the 4th Anniversary of publishing my first book, Ghost Lover! Wow, it’s been a wild ride, but one I’m glad I got on. As for my surprise, here’s a little hint: This surprise is being set up to help fellow authors market their work. It’s going to be a really exciting venture. Being a writer myself, I know the hardships of trying to get your book in front of the reader. But that’s all I can tell you at the moment. I know, I’m being vague, but the final stages of the process are not ready to be revealed. If things go well, I should be able to make the final reveal next week. But I can tell you this, for those that share the reveal and post it, there will be some free goodies for them. I hope you have a great Friday. Enjoy the day and know, only a couple of hours til the weekend. Categories: Uncategorized | Tags: #amwriting, Anniversary, Authors, Friday, Ghost Lover, Publishing, Ramblings | Permalink. This is the cowboy that started it all, my writing career that is. It’s hard to believe how long it’s been since Ghost Lover was published. 2012 was an exciting year, I took the leap into publishing my writing. Let’s take a look at the book that led me down this wonderful road as an author. I know, this was a sneaky thing to do, but this is one of my many favorite parts of this book. The letter that took them to a whole new world. 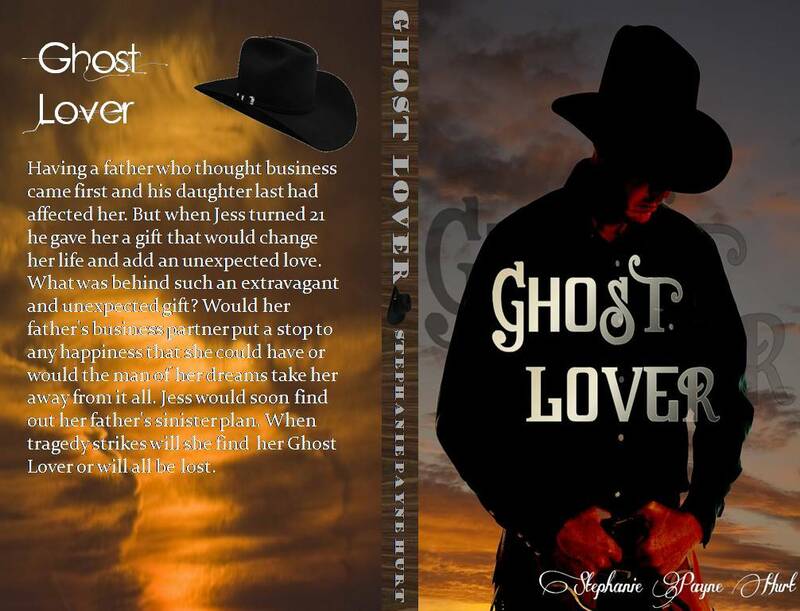 Go by and check out Ghost Lover. I know you’ll fall in love with the love story of Jessie and Jared, I did! Categories: Uncategorized | Tags: #amediting, #amwriting, Authors, avonromance.com, cowboy romance, Ghost Lover, Love Story, Romance, Throwback Thursday, Writing | Permalink. I guess you could call this a throwback thursday post. Today my first published novel turns two. It’s hard to believe that it’s been two whole years. Some days it seems like it was only yesterday. As I mentioned in an earlier post, Ghost Lover is under a face lift right now. The cover and manuscript are being worked on even as I type this post. Since this was my first book it needs a little work. I’ve learned a lot in the last two years and I want to bring that knowledge to this first book. As for the cover, I dearly love the cover on the current book, but as it will be a fresh remake it needs a new look. Of course when I first published this book it had another cover. Let’s just say the first two covers that I designed were, well newbie. My cover designer finally took over the mouse and pushed me out of the seat shaking her head. That’s when she designed the cowboy in the sunset cover. She walked into the stables and leaned on a post just inside the doors. She sniffed the air for a hint of the scent she had smelt earlier. It was not long before the scent went by her nose. She stood very still and let the wind direction lead her nose. She could tell it was coming from the back of the stable around the door that led to the back field. A shape formed out of the shadows. It was a man in a cowboy hat. She could not see his face only the dark shape. Was this an illusion or ghost? She was drawn to the shadow by some unknown feeling. “Should I be afraid of you?” She suddenly realized that she should be afraid but she could not move. “I would never harm you.” He slowly moved closer but still in the shadows. “Why are you here in the shadows? Why don’t you come into the moonlight so that I can see you?” She noticed he lowered his head and then looked back toward her. “What is wrong? Have you been injured in some way?” Her heart went out to him. “You will remember it. I do not want to rush your memories. When you remember, you will know me.” Why did she want to reach out to this person so much? “Were we friends?” Could this be the man in her dreams that she could not see his face? Had he been scarred when she knew him before her accident? “Yes, we were very close. I know you have me locked in your memory and it will come out.” He reached his hand out of the shadows and stroked her face. His touch set off an electrical charge through her veins. “What do you think?” She tried to see him through the shadows, but could not see his face. “What kind of danger? He said he is my husband.” She could hear the footsteps getting closer. “Just trust me; he is not your husband.” He put his hands on both sides of her face and kissed her so gently that she almost lost her footing. “Don’t tell him about me. I will be here waiting for you tomorrow night at midnight.” He slowly went back into the shadows. She could hardly catch her breath. I hope you enjoyed that little snippet of a pivotal part of this cowboy romance. I loved writing it and it’s as though my baby is growing up, so we need to changed it’s clothes and make it better. Thanks to my wonderful fans for making it a popular book. Categories: Uncategorized | Tags: Covers, Ghost Lover, Rewrite, Stephanie Payne Hurt, Throwback Thursday, Writing | Permalink.